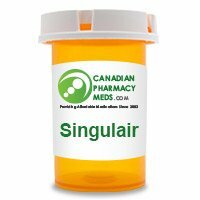 We sell Singulair, generic equivalent Montelukast Sodium, and Canadian Singulair Online to those who have RX Prescriptions from your Doctor. Singulair is the trade name for the generic Montelukast Sodium developed by Merck Sharp & Dohme Corp., a subsidiary of Merck & Co., Inc. It can improve the symptoms of Asthma and Chronic Rhinitis by blocking Leukotrienes which occur when there is inflammation. These are released when the body inhales allergens, such as pollen or dust. The airways in the lungs become swollen which prevents enough oxygen being absorbed and results in the symptoms we associate with Allergies, such as shortness of Breath, Wheezing and Coughing. Although it does not provide relief during Asthma Attacks, patients who buy Singulair online or at their Local Pharmacy can expect to be provided with longer-term relief and prevention of symptoms. One of the benefits of Singulair is that, unlike many other treatments in this field, it does not contain Steroids, which often have significant negative side effects for a wide range of people. As well as reducing the broader symptoms of asthma over time, it has also been proven to reduce exercise-induced asthma and a number of the ongoing symptoms of rhinitis, such as sneezing, itching and a runny nose. Singulair can be used in this manner to treat children as young as six months old, in some cases, as well as for Seasonal Allergies across a range of age groups. It is possible to order Singulair in tablet or granular form, depending on the age of the patient. The amount which should be taken, and the time at which to take the drug on a regular basis, will be clearly stated by a healthcare professional and should be closely adhered to. It is always a good idea to talk through other drugs or herbal remedies which the patient is currently taking with a doctor before taking any new drug. Often, for example, Asthma patients are intolerant to aspirin and, if this is the case, it is sensible to continue to avoid taking it whilst taking Singulair. There are some side effects which can be associated with taking this drug and it is worth considering the likelihood of these occurring with a Doctor prior to deciding to buy Singulair. They can include Headaches, Fever, Stomach Pain, Coughs and a Sore Throat, amongst others. In addition, it can sometime cause behavioral changes in children, so they should be closely monitored for any unusual traits such as increased aggression, restlessness or irritability. The primary active ingredient in the drug is Montelukast Sodium, each version of the medication also includes a number of inactive ingredients and patients should check that they are not allergic to them, in conjunction with their healthcare professional, before agreeing to buy Singulair online or from a Local Pharmacy as part of a treatment plan. For asthma sufferers, this medication should also be combined with a quick relief inhaler for use during asthma attacks.